Modern and super chic, stylish squares are a sophisticated touch to any wedding. A classic and larger shape with plenty of space to share your ceremony details. Destination or beach wedding? These are simply perfect for a seaside affair! The company customized our programs & they are beautiful! I will definitely recommend to others! These programs were the perfect size for out outdoor wedding, and they were durable to the elements as well! I loved them and will order them again if I even need programs!!! I purchased for my son's wedding in the Florida Keys. Not only were they beautiful...they were functional and made very well. I loved them, easy to design, shipment was very prompt. The bride ended up purchasing the Thank you notes to match. Wonderful company to work with and products are very nice quality for the money. Will definitely order from this site again! I ordered fans that doubled as programs for ceremony chairs for my destination wedding. They arrived in the next week! The editing program was easy to use and entirely customizable. I am extremely pleased with the overall result. I also got a huge discount by using an offer code the website had available that day. Grab ideas on the right type of program wording for your needs. Children not invited? That’s okay, but here’s how to properly handle it! A few ideas on handling an asymmetric wedding party for your big day photos. Cue the tears for the big walk down the aisle! Find a song that suits you. Having an outdoor or summer wedding? 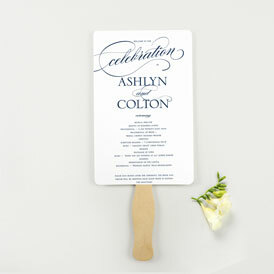 Help guests beat the heat by handing out personalized Wedding Program Fans! 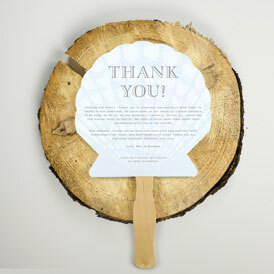 By turning your program into a hand-held fan, your guests can stay relaxed and refreshed. 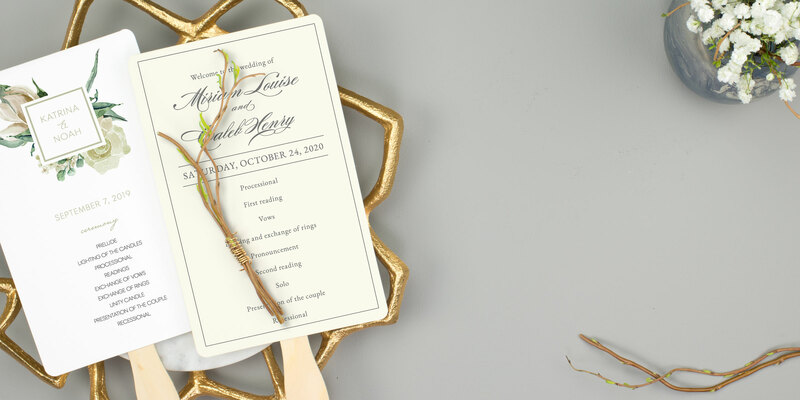 Personalized in your colors, fonts, and wording, Wedding Program Fans not only keep your guests cool—they also serve as a fun, reusable keepsake for guests to take home! Shell Program Fans: Seashell-shaped fans will lend a beachy-ambiance to any seaside celebration as well as a practical keepsake from your destination wedding. 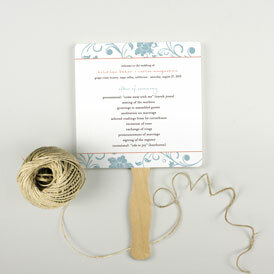 Rectangle Program Fans: In a true classic shape, Rectangle Fans give you ample room to include all the details you want your guests to know: rituals, songs, wedding party bios, etc. Heart-shaped Program Fans: The ever-iconic symbol of love, this style is sweet and irresistible. Square Program Fans: Modern, fun and come in a distinctive shape that’s great for unique or contemporary services.